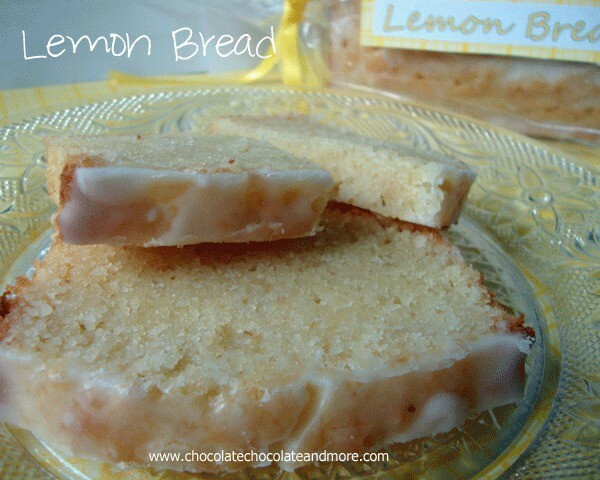 Lemon Bread - Chocolate Chocolate and More! 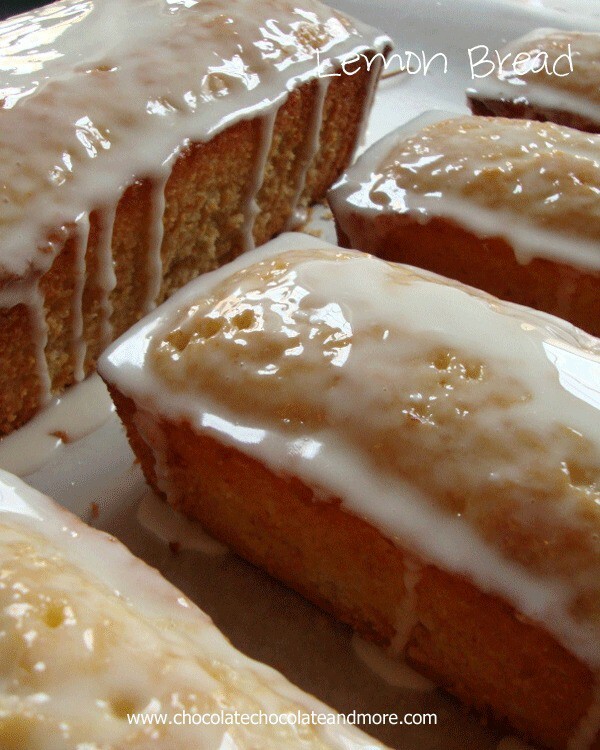 Lemon Bread-perfect with an afternoon cup of tea. Also makes a great gift! But everyone’s doing it… If everyone jumped off a bridge would you jump too? But it’s just so addicting. You have other thing that need to be done. I know. Sigh. This is a conversation I have with myself almost every day. I’m talking about Pinterest. What did you think I was talking about? hummmm….. Nevermind. I probably don’t want to know. Pinterest is addicting, but I can justify it. I find the best ideas to try. Not just cooking but decorating, crafts. A picture IS WORTH a thousand words. And the picture and the name of this recipe just sucked me in. 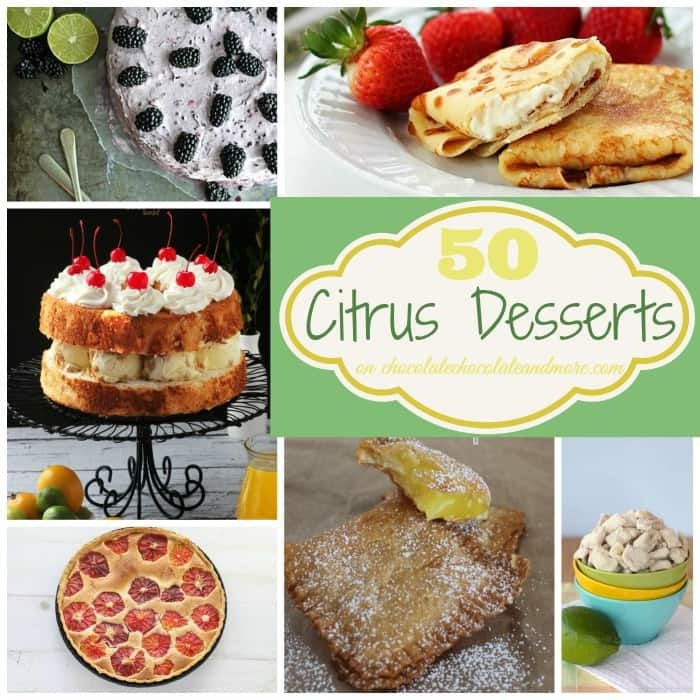 Save your favorite recipes to your personal recipe box with the button on all my recipes! Create a Meal Plan with your “favorite” recipes and the ingredients will automatically be added to your own Grocery List! Sift flours, Baking soda, baking powder and salt together. In separate bowl, combine sugar, eggs, lemon zest and lemon juice, mixing with mixer till well blended. Continue mixing and add butter, then sour cream and vanilla. Fold in flour with a rubber spatula, 1/3 at a time. Mix just till all flour is combined. Pour into prepared pans, and bake at 350 degrees for 20 minutes. At 20 minutes, rotate pans (I didn't) and turn down oven to 325 degrees and continue baking for another 30-35 minutes. Use a toothpick to test for doneness. My little loaves were done at 25 minutes, the larger one at 30. Immediately after removing from oven, run a knife down the sides of the pan to prevent sticking. Once cool enough to handle, about 15 minutes, remove loaves from pan to a wire rack. Step 2-the lemon syrup-Combine 1/3 cup sugar and 1/3 cup lemon juice in a saucepan. Heat over low temperature until sugar is completely dissolved. Once dissolved, heat for an additional 3 minutes. Remove from stove to cool. When loaves are almost cool (still slightly warm) place on parchment lined cookie sheet and poke holes in tops with a toothpick. The more holes the better. Now take that lovely sour syrup and brush over the tops of the loaves. Let the syrup start to soak in then glaze a second time. You want to use all the glaze, trust me. Step 3-the glaze-Combine powdered sugar and lemon juice, just till all liquefied, don't let it get too runny or it will all run off your loaf onto the parchment paper. And you want this glaze on your loaf. Yes you do. Now start spooning the glaze over the tops of your loaves. Use the back of the spoon to make sure you get your corners. Try not to let it run off the top, when it does, stop and let the glaze set then apply a second coating. Let the glaze set completely before removing. This bread is wonderful. And it is a bread not a cake. It has a bread like texture and is not very sweet. The flavor of the lemon comes through nicely but doesn’t over power. This definitely packages well and would make a lovely gift. And since the recipe does make 2 full sized loaves, you can share, can’t you? Thank you Glory for sharing this with the rest of us! This is absolutely one of my favorite tea breads! O dear!! I’m simply going to have to make this! 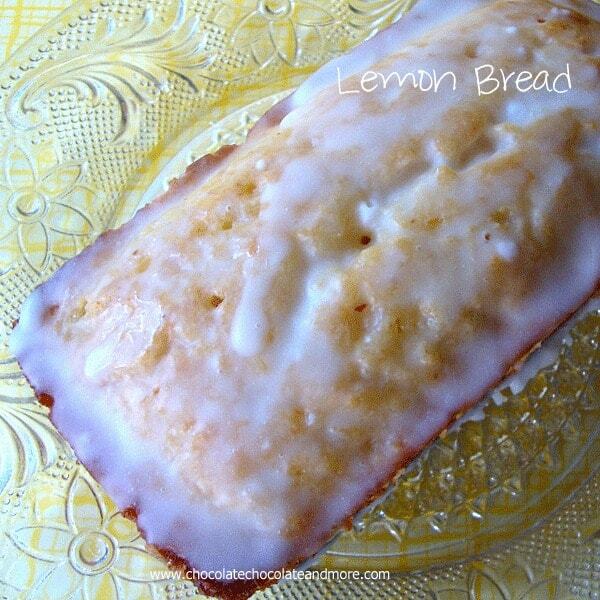 I adore lemon bread!! Thanks for sharing at oopsey daisy! 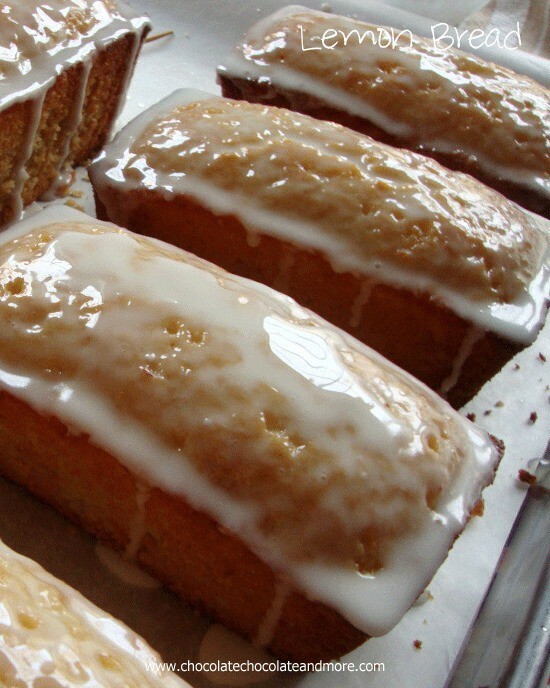 These lemon loaves look amazing! The Lemon loaves look amazing! I’m definately going to try it out. Honestly, I’m new to cooking, and haven’t had a chance to surf through your website. But I shall definately try this recipe and more in the future. I’m a fan on your facebook page. Just finished cutting into this bread… It is Fabulous. It seems more like a cake. Really does not matter… Both go down the same way. The bread has a great texture. I followed exactly as the recipe suggested except I added coconut on top of the glaze before it set. In the powder sugar mixture I added just a small amount of coconut with a dash of coconut extract. This is a cake that will be made at least once a month in my home of one with very little being shared. Each day I go from blog to blog making my weekly list of must-makes. If it is picked that week it will be baked. So glad I bumped into your blog … Thank you so much. I’m so glad you enjoyed it Mary, I love you addition of the coconut. Lemon and coconut go so well together. Joan ~ This sounds so delicously springy! It is making me think of warmer days ahead, so I should be making this soon! pinterest and lemon…both my downfalls! Could this recipe be made in mini loaf pans and how long would I bake them? Oh yes, you can definitely make these mini, shorten the time by 5 minutes and then check them with a toothpick for doneness. Enjoy! Thanks Joan. I hope to make these as Christmas gifts. Looks delicious. Hi Lauren, yes, the mini paper loaf pans or I have smaller ceramic ones. Just divide the mixture and then cook for 5 minutes less. Use a toothpick to test for doneness. A few crumbs sticking to the toothpick is fine you just want your batter fully cooked. Just finished making these loaves. They were not as lemony as I thought they would be but they are delicious. The texture is what is wonderful, more cakey than a bread loaf and simply lovely. Thanks for the great recipe, will be making these again for sure! Next time try doubling the syrup and make sure you poke a LOT of holes all the way to the bottom. I have to admit these look delicious. But a POUND of butter and more than 4 1/2 CUPS of sugar? I can’t make these. Perhaps as a gift for someone I don’t like. Come on Dave…why do you think they are so delicious!! Does it have to be cake flour?? Regular won’t work? Thx. I’ve made this many times. It’s our favorite dessert around here. I double the syrup, though, and I’ve found it looks much prettier baked in a bundt pan!! Oh and also, I use 2 cups cake flour and 1 cup all purpose flour. I also use 4 teaspoons vanilla bean paste and at least twice as much lemon zest as called for. I also make extra glaze too… lol. 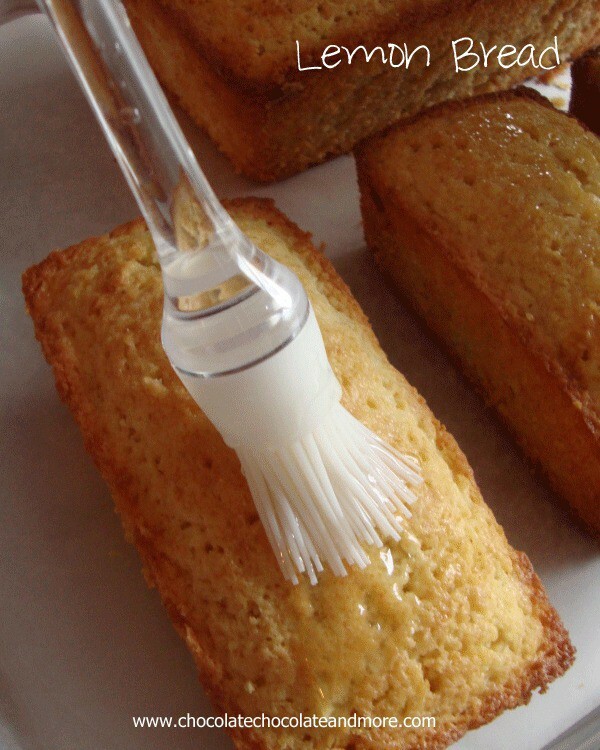 One last thing… When using the bundt pan you can poke holes in the bottom and brush the syrup on, then remove from pan, poke holes all over the top, sides, and inside the hole and brush syrup on the entire cake… just be sure to double the amount of syrup you make. Love your recipes! This looks delicious but I never buy cake flour . I only use all purpose flour……What can I do to make it come out right? Thanks! This recipe is the best! I made two loafs and took one to work for the guys. THEY LOVED IT! The whole thing was gone in less than two hours and many were disappointed when they came back for more and it was all gone. I have to say the other loaf tasted as good as the first! Family and friends loved it. Does it have a lot of sugar and butter? Well, yeah, that’s what makes it taste so good. It’s a treat for sure and one I will make again! Wow! Exactly what I want to eat right now with my cup of tea. What’s exactly the size of the 2 regular pans? Thanks.